The Universal Plant ChIP-seq kit offers the convenience of extracting plant chromatin from a wide variety of plants including Arabidopsis, maize, rice, tomato and poplar. This complete kit has been specifically optimized for plant chromatin extraction and includes reagents for chromatin preparation, immunoprecipitation, plant-specific control primer pairs, control antibody, and DNA purification. Figure 1. 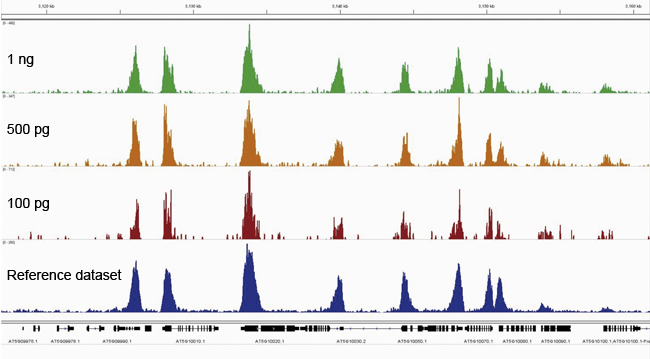 ChIP-seq was performed on Arabidopsis thaliana (Col-0) seedlings using our Premium H3K4me3 ChIP-seq grade antibody. 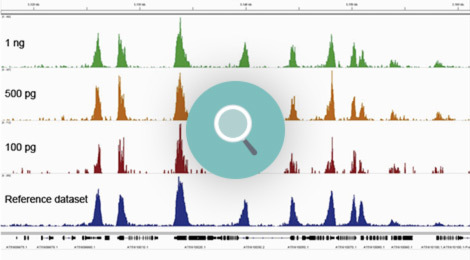 Libraries were prepared with our MicroPlex Library Preparation™ kit from 1 ng (green), 500 pg (orange) and 100 pg (red) IP'd DNA and sequenced on an Illumina® HiSeq 2500. The enrichment in blue represents a public dataset (NCBI GEO Dataset GSM1193621) that we used as an external reference. Enrichments along a wide region of chromosome 5 are uniform regardless of the starting material amount for the preparation of the library. Figure 3. ChIP-seq was performed on Populus trichocarpa stem differenciating xylem using the Premium H3K4me3 ChIP-seq grade antibody. Libraries were prepared with the MicroPlex Library Preparation™ kit from 1 ng of immunoprecipitated DNA using the Universal Plant ChIP-seq kit and 1 ng of Input and sequenced on an Illumina® HiSeq 2500. The enrichment in green represents the input and is considered as the background enrichment. The profile in red represents enrichments along a wide region of scaffold 18. Using the same scale, the peaks of the immunoprecipitated samples are significantly higher than those of the input, indicating a successful ChIP-seq experiment. Figure 2. ChIP-seq was performed on Solanum lycopersicum cv. Micro-Tom young leaves using our Premium H3K4me3 ChIP-seq grade antibody. Libraries were prepared with our MicroPlex Library Preparation™ kit from 750 pg of immunoprecipitated DNA using the Universal Plant ChIP-seq kit (red) and sequenced on an Illumina® HiSeq 2500. The enrichment in blue represents a dataset obtained from Nguyen et al. 2014 that we used as an external reference. Enrichments are higher and consistent with the reference data along a wide region of chromosome 1. Figure 4. ChIP-seq was performed on Zea mays cv. B73 inner stem using our Premium H3K27me3 ChIP-seq grade antibody. Libraries were prepared with our MicroPlex Library Preparation™ kit from 1 ng of immunoprecipitated DNA using the Universal Plant ChIP-seq kit and 1 ng of Input and sequenced on an Illumina® HiSeq 2500. The enrichment in green represents the Input and is considered as the background enrichment. The enrichment in red represents enrichments along a wide region of chromosome 3. Using the same scale, the peaks of the immunoprecipitated sample are significantly higher than those of the input, indicating a successful ChIP-seq experiment. Diagenode strongly recommends using this:	Universal Plant ChIP-seq kit (Diagenode Cat# C01010152). Click here to copy to clipboard. Add Chromatin Shearing Optimization Kit (Universal Plant ChIP-seq kit) to my shopping cart.